One of the central themes of JP II’s Theology of the Body is that the body has a “nuptial meaning.” On his blog, Msgr. Charles Pope gives a brief explanation of the nuptial meaning of the body, specifically as it relates to the priesthood. To speak of the nuptial meaning of the body, means that the very design of our body orients us toward a marital (nuptial) relationship. The man is obviously meant for the woman, and the woman for the man. And in this complementary relationship that we call marriage, there is the fruitfulness of children. To speak, therefore, of the “nuptial meaning” of the body, is to insist that our sexual distinctions of male and female are not merely arbitrary physical aspects. Rather, they bespeak deeper, spiritual realities, that we must learn to appreciate, and respect. Men and women are different, and manifest different aspects of God’s relationship to these people. Women, manifest the glory of the Church Bride. Men manifest the glory of Christ as Groom. In terms of the priesthood, this is important because Christ, in his humanity, is not simply male, he is Groom. 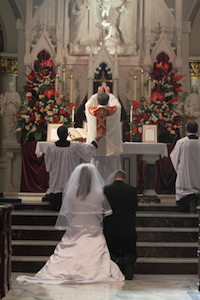 And the Sacred Liturgy of the Church is not just a celebration, it is a wedding feast: Christ the Groom, intimately with his Bride the Church. Thus, your pastor is invoking a rich theological teaching, which helps to explain one reason why Christ chose only men for the priesthood.